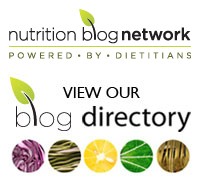 You are here: Home » Dietitians of Canada Nutrition Month: Take the fight out of food! It’s hard to believe it’s already March and that means, it’s Dietitians of Canada Nutrition Month. This year’s theme, Take the fight out of food!, expresses so much about what is happening on the food and nutrition front nowadays. And front is definitely the right word as many people are at war with their food and what they think they should be eating. While there are true issues for many surrounding what they can eat – food allergies and intolerances, auto-immune diseases such as celiac disease and other medical conditions, the pleasures of healthy eating and food have been lost for many people as they seek out answers in almost a religious or fanatic style. Being a healthy eater shouldn’t elevate an individual’s status or improve one’s moral standing. Yes, there are definitely ethical issues such as climate change, surrounding food choices but that’s not what I’m talking about. I’m referring to the one-upmanship that is happening when individuals jump on the latest fad. Going gluten-free, dairy-free, vegetarian, vegan, detoxing or being a consumer of the latest supplement a friend is taking (and maybe selling) doesn’t make one person better than another. It’s time to stop preaching or allowing yourself to be preached to about food. Not being a clean eater doesn’t make you dirty. It’s time to respect each other’s choices. What you choose to eat should not equate with doing something illegal or immoral. You should not need to confess your indulgences. Yes, it’s time to take the fight out of food. Here’s some advice from the Dietitians of Canada, the association which represents my profession. Spot the problem. Get the facts. Seek support. Put the plan into action with support from a dietitian, family and friends. Up next: The most important thing you should do before you go gluten-free. ← Your Facebook questions answered: Are GMO foods nutritious and safe?